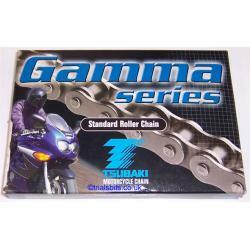 A standard Japanese made Tsubaki Gamma series chain with a 415 pitch (1/2 X 3/16) supplied with 130 links which should be long enough for just about any application. It is supplied with a split link. If you need to shorthen the chain, I sell a chaincutter in the tools section of this site. This size of chain is typically used on mopeds, but also on some of the smaller trials bikes such as the Sherco 50 auto.